Packing a Nutritious Punch Sejal Mistry ’17, a biology major and poverty studies minor, has completed a service project that aims to improve the nutritional value of foods in the Campus Kitchen at Washington and Lee’s Backpack Program. When Sejal Mistry ’17 was still living at home, she didn’t have to think very long or hard about dinnertime. Food was placed on the table, she was called to supper, and she tore herself away from her phone and her schoolwork to join her family for a meal. Mistry’s involvement on the leadership team for the Campus Kitchen at Washington and Lee is partially responsible for her changing perspective on food. But a biology class and a community-based research (CBR) project also have opened her eyes to the importance of variety and quality in a person’s daily diet. The class is Professor Sarah Blythe’s Food for Thought, which examines nutrition and metabolism as they relate to neuroscience. To fulfill the service-learning requirement for the class, Mistry took on a project that analyzes the nutritional value of the foods used in the Campus Kitchen’s Backpack Program. Her findings may lead Campus Kitchen coordinator Jenny Davidson to reassess the makeup of the snack packs, which are sent home every weekend with more than 700 local elementary- and middle school-aged children. The kids who receive the backpacks are eligible for free or reduced lunch. The program, established in 2009, is meant to ensure that they have enough snacks to get them through the weekend. The backpacks, which are packed by volunteers and delivered to schools every Thursday, typically contain at least seven food items, such as cereal, oatmeal, applesauce, snack crackers, fruit gummies and — in the case of older children — cans of soup. The program is primarily funded through grants and fundraisers, and most of the food is purchased from the Blue Ridge Area Food Bank and US Foods. The current budget is $1.50 per backpack. For some time, Davidson has wanted to take a closer look at the foods used in the program in order to determine whether they are providing the maximum possible nutrition for the price. Mistry’s project dovetailed nicely with that goal. Mistry is a biology major and a Bonner Scholar who is minoring in poverty and human capability studies. The class also counts as a poverty credit and fulfills a requirement of the Bonner Program. For the project, she created a spreadsheet with nutritional information and a cost analysis. Davidson will use the information to determine whether new products should be substituted for those commonly used in the backpacks. One of Mistry’s preliminary findings was that fortified foods, such as cereal and oatmeal, will continue to provide the most vitamins and minerals at the lowest price. While it would be nice to include fresh fruits and vegetables in the backpacks, it is not feasible from a financial or logistical standpoint. Mistry also noted that some products should be reconsidered based on their sugar or fat content. Fruit gummies are popular with kids and contain less total sugar than applesauce, but the sweetener in applesauce is natural sugar. “So it’s taking those little things into account,” she said. Of course, just because a food is nutritious doesn’t mean elementary-aged children, the primary focus of Mistry’s project, will want to eat it. There’s no sense in spending money on food and sending it home with children if it will only go to waste. Now that Mistry has completed her data, Campus Kitchen Outreach Coordinator Chris Caplinger is surveying program clients to determine which products are popular with children and which are not. All of this research and thought will go into improving a program that so many students in Lexington and Rockbridge County schools depend on. Mollie Robinson, a counselor at Central Elementary School in Lexington, said she discreetly distributes backpacks to 80 or 90 students each week. Want to support the Backpack Program while enjoying delicious soup prepared by area chefs? 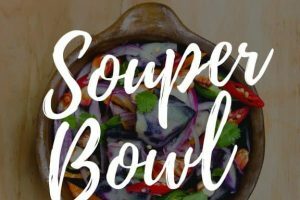 Don’t miss the 5th Annual Souper Bowl on Jan. 29. For more information, click here.